Genetic sample from Isle of Palms beach. One of the most interesting things we get to do as Turtle Team members is to investigate the “scene of the crime” where a turtle has laid her eggs on the beach. We study the field signs to see where the eggs might be hidden, and we find out as much about her as we can from these signs left behind. 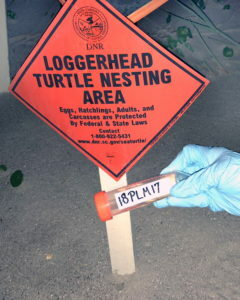 For the last nine years we have also taken a sample of each individual female’s DNA which is an empty egg shell placed in a vial of alcohol with the year, the code assigned the beach (PLM or SUL for us) and the nest number which correlates to those in the central database of nests recorded online by us in www.SeaTurtle.org. How many clutches of eggs does each nesting female lay in a year? Is the female nesting on more than one beach? How far apart are her nests? How many turtles are nesting in more than one state? How often does each turtle nest: every 2 years, 3 years, 4 or more years? How precisely does a daughter return to her hatching site to lay eggs? For more specific information go to: dnr.sc.gov/seaturtle/volres/ genetics.pdf. With thousands of samples to read from multiple states, it takes a while for these results to be read, but we have started to receive some interesting facts about the females that have visited us this year. Our LEATHERBACK turtle who laid IOP Nest #3 on May 29 in Wild Dunes had also nested on May 18 on Lighthouse Island in the Cape Romain area. And after our nest she went to Morris Island and laid again on June 11. This is the first record of a sample from her anywhere. She could be young and just starting to reproduce or she just may not have nested in NC, SC or GA before. There are so many nests in FL that she could have nested there, but no sample from her was analyzed. Loggerhead #4417 who laid Nest #1 on Sullivan’s Island near Station 28 ½ on May 27 has really gotten around, having nested mostly in the Georgetown area in 2012 and 2015 at Huntington Beach State Park, Litchfield Beach, Sand Island as well as Bull Island. Loggerhead #788 is a veteran. She has been recorded nesting 20 times and 19 of these have been in the Cape Romain National Wildlife Refuge except she slipped up and laid IOP’s Nest #1 at the 1B Beach Access Path on May 19. She was probably on her way “home” to Cape Island because all of her subsequent 2018 nests have been there. Loggerhead #5539 laid Nest #2 on IOP at 38th Ave. on May 22. She is a mystery girl having only been known to nest once before on Cape Hatteras, NC in 2012. We don’t know where she’s been, but we are glad to welcome her here. Loggerhead #11080 is probably a young female who is nesting for the first time this year – no previous records on her. She laid Nest #4 near 4th Ave. on the IOP on June 3 and then nested again on June 17 at Botany Bay near Edisto. Loggerhead #1415, another seasoned nester, has 19 recorded nests and always nests in even years, laying many eggs every two years in 2010, 2012, 2014, 2016 and now in 2018. In early years of this decade she visited Kiawah, Folly and Seabrook. But more recently she has favored us with 6 nests. But like so many others she really prefers Cape Island. She laid IOP Nest #5 on June 5 near 8th Ave.
Dr. Shamblin has told us that there is a female laying eggs at Cape Romain where the majority of SC Loggerheads nest who has 12 daughters and 4 granddaughters also nesting, some near her and some not. This is pretty remarkable since it takes each one 25-30 years to reach sexual maturity and only 1 in 1,000 survive to do so. Mary Pringle has been the Project Leader for the Isle of Palms/ Sullivan’s Island Turtle Team since 2000. It is one of about 30 nest protection projects under the South Carolina Department of Natural Resources. She is also on the Sea Turtle Stranding and Salvage Network.